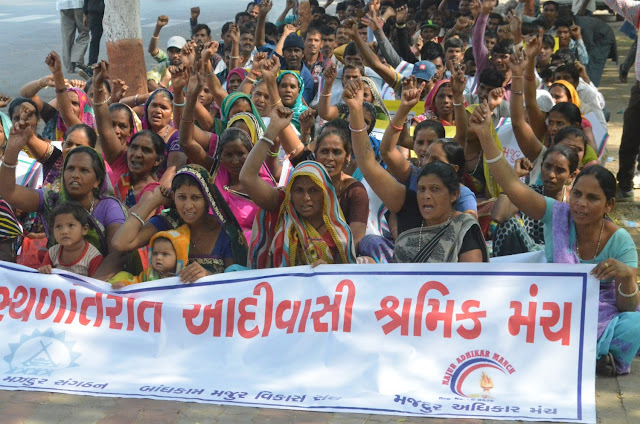 Amidst hype and hyperbole around Gujarat polls, the real story never gets asked: What does it mean for the people? I would say the answer is this: it is a barren and hollow place to be if it meant sticking a mike in the face of a BJP or Congress party spokesperson to extract one homilie after another. “We’ve won although we’ve lost,” or “We may have lost ground but we’ve won.” Because in all the hype and hyperbole, the real story never gets asked. What does all of this mean for the people? That as I see it is the job of every political reporter to answer. Feet in mud, noses in vada pav stalls and the sweat and the blood of the people. Here is what the report from the trenches looks like. The one you won’t hear about on TV or read in the more arithmetic of politics type of writing. The palpable fear in the eyes of a tribal farmer who works seasonally at a construction site a hundred kilometres away. Who let go of two days of daily wages plus spent on bus fare and food to get to his village and vote. This is a man who earns 250 rupees in a day and cannot spend more than 20 or 30 of that so he can bring the rest back home and live off it in the next season. “Why have you spent about 2,000 bucks just to vote when you have no money for food and live in a tarpaulin tent on the road?” I asked him. Fear was the reluctant but honest reply. “Fear of what,” I persisted. “The fear of having your name struck off the ration card and BPL card and the panchayat coming to your home and threatening you if you don’t comply.” As he finished speaking, the other men – all tribals; standing with him nodded in agreement. 22 years of the BJP has driven that point home. It is a well-oiled machine, which does not mean that it delivers on any of its election promises. It means one thing only. It delivers fear with regularity and precision. Far away from the tribal districts in Northern and Eastern Gujarat, an autorickshaw driver in Ahmedabad city brought home a few more truths. His gold earrings glistened in the midday winter sun as he spoke his mind. “These earrings,” I wanted to know where they were from. The aesthetics are always important. “Palanpur,” he declared proudly. And added – “Aadha tola sona” which is what they weighed. And finally, the price. “17,000 rupees,” he added without my asking. It wasn’t hard to guess he was a BJP supporter. Part of the aspirational middle class that believed the party delivered the one thing they wanted, in order to feel secure. The total and complete emasculation of Muslims in the state. The driver turned to me to explain. “Madam, Modi is like a dacoit.” He’s burned big holes in our pockets. We are in penury and now we’re going to pay even more when the bullet train he’s planned actually starts to take off.” This was some serious bile coming out. The auto-rickshaw driver drew a straight line between what he believed was a 88,000 crore loan that Modi inked with the Japanese Prime Minister to build a bullet train in the state; with an eventual drain of wealth. Was it the effect of demonetization and GST at work here? Did it mean that Modi’s popularity was on the wane? Yes and no. The vitriol against him has been spewing in the streets of Gujarat for a year or more, then disappearing like sludge into drains. What does the verdict of a 100 and more seats say about the people who voted in favour, then? That thirty years of indoctrination by the Hindu right will take more than a few campaign speeches and visiting of temples by Rahul Gandhi to come unstuck. And that the fear of The Muslim as The Other hasn’t changed too much from the last election in 2012. In tribal villages I visited, as people gathered around tiny fires the night before they voted; they made one thing amply clear. “Hindustan is for Hindus.” Repeated over and over. And what has this Hindu-favouring regime done for the tribals, I asked. Much raucous laughter followed, making it clear that this election was mainly about a twin fear playing out in people’s minds. The fear of going against the BJP and the fear of the Muslim. As the results started to trickle in, there was another kind of fear that rent the air. What if this is a close contest? What if the BJP loses? Will their supporters take to the streets and burn buses? Effigies? People? In private spaces in living rooms, where some watched the results on TV, there was a little bit of relief when the last votes were counted. It was over. There was no reason for right wing vigilantes to resort to violence. The party they support has won. In the face of such extraordinary fear and such little hope from the opposition, it would be easy to forget the real heroes of this election. And indeed, they seem to have been quickly forgotten. The people who turned up in thousands, knowing that going against the grain and voting for the Congress may have their names struck from ration cards. Or grants put on hold. But who went out and voted for the Congress anyway. Not because they believed in the party or the speeches or Rahul Gandhi. But because they preferred to put their votes in a void, just to shake things up a little. It was enough dissent of enough people with no faith in the alternative or hope of their coming to power; for it to amount to over 70 seats falling off the ruling party’s grid. Considering the atmosphere in which this dissent was voiced, that was quite a resounding voice of dismissal. Dismissal of the BJP’s PR and that of the Congress. And of us media-wallahs that perhaps need to be reminded that we too are losing ground. The 70 seats worth of voters that went against the regime defied all the odds in their utter rejection of everything except their right to say, frankly my dears, we couldn’t give a damn.